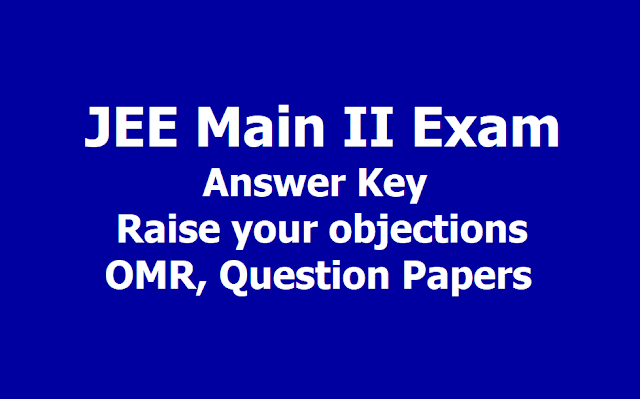 JEE Main II Answer Key, OMR, Question Papers 2019 on jeemain.nic.in: JEE Main II 2019 April examination answer keys and question papers have been released by the National Testing Agency (NTA). The links to check question paper and answer key is now available on jeemain.nic.in. Candidates who have appeared for the examination can check their Question papers, Recorded Responses as well as the official Answer keys online. Important instructions as well as steps to check and raise objections are provided below. Candidates are advised to go through the instructions before checking their answer keys. The NTA has released the answer key for the JEE Main II 2019 on the official website. The candidates, who have appeared for JEE main II 2019 can visit official website JEE Main- jeemain.nic.in- to check the answer keys. Candidates can also challenge the JEE Main II 2019 answer key through the official website. NTA has also released candidate question paper and the responses attempted thereon by each candidate on the website. The official notification reads “The National Testing Agency has uploaded the Answer Key for candidates to challenge. The procedure (as enclosed) for challenge of Answer Key may be used. This facility is available from 14.04.2019 to 16.04.2019 (up to 11:50 PM).” NTA had conducted JEE Main II 2019 on 07, 8, 9, 10, and 12th April 2019 through the Computer Based Test (CBT) mode. A total of 9,58,619 candidates had registered for the JEE Main II 2019 April exam. It is to be noted that candidates need to pay Rs 1000 online as a processing fee for each question challenged. If the challenge is found correct, the processing fee will be refunded to the candidate. The notification further reads "The Candidates are required to pay online a sum of Rs. 1000/- (one thousand only) as a processing fee for each question challenged. The payment of the processing fee may be made through Debit/Credit Card/ Net Banking. The processing fee will be refunded if the challenge is found correct. No challenge will be entertained without receipt of processing fee." All the students who appeared for the examination are reminded that the window to check JEE Main II answer key and raise objections would remain open till 11:50 pm on April 16, 2019. No representation would be entertained by NTA beyond the time provided on the same. To compute your JEE Main II 2019 April result, simply add all the answers marked by you that tally with the ‘correct option’ and the number of answers which do not tally with the answer key provided. Your raw score would be calculated as 4 X Number of Correct Answers – Number of Incorrect questions.